US Airforce Army Surplus Raincoat. Size Large, chest 42. Short fit. Without linen inside. Elvis Presley Denim Jacket. Purchased at Graceland. Well looked after. Hardly worn. Very good condition. Originally eyewateringly expensive. Quality heavyweight material. Reasonable offers invited. 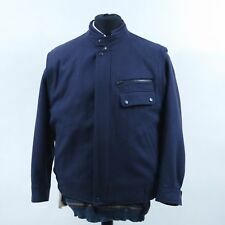 Hugo Boss Mens Blue Wool Overcoat Jacket 44R. Condition is Used. Dispatched with eBay delivery – Shutl 1 day. Condition is good but Used. Waterproof and windproof PU coated polyester. Comfortable and lightweight tricot knit. Stitched and welded seams. 2 Lower pockets. Full wrap around detachable hood. Studded double stormflap. Adjustable shock cord hem and hood. Lacoste Bubble Jcket Navy 52. Condition is New with tags. Dispatched by Royal Mail, beautiful cosy fit jacket, the jacket can be turned into a bag if you reverse the jacket in the zip compartment. Free uk delivery. Levi's Blue Denim. Size on label: XL. Material: 100% Cotton. We try to respond as soon as we can. lyle and scott Puffer Jacket . Royal Blue Large. Polo Ralph Lauren Cotton Poplin Windbreaker, Size L. Navy Blue.